Control your entire smart home including locks, lights, thermostat, and more with the sound of your voice. Combine voice control for your smart home with music, sports scores, traffic & weather reports, and more. Fills the room with immersive, omnidirectional audio. Alexa can hear you from across the room and respond, even while music is playing. Quickly responds to questions and commands. Play music from your favorite web-based music service, or use Bluetooth to stream your own music straight from your mobile device. 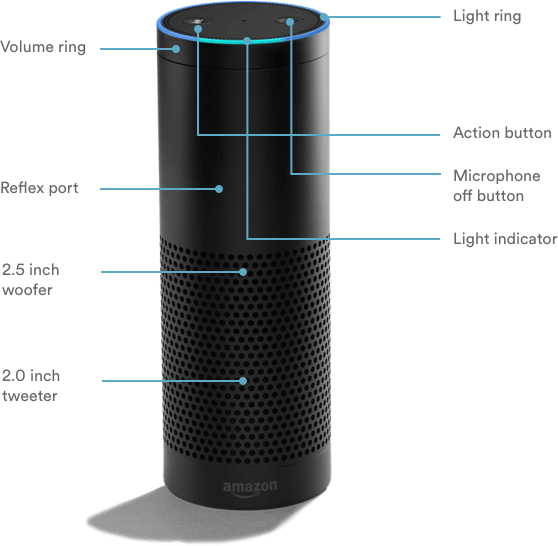 Amazon Echo gives you hands-free control over your home using only your voice. Even if you're playing music or standing across the room, when you say a command or ask a question, Echo's far-field voice recognition and seven-piece microphone array hears you through the din. You don't have time to waste, and neither does Echo. Its quick reflexes and speedy responses ensure you'll get recipe conversions without putting down a measuring cup, adjust the thermostat without leaving the room, or close the garage door without pressing a button. Because it integrates into Vivint Smart Home Cloud, Echo gives you voice control over every aspect of your smart home system. Welcome bedtime by setting the thermostat, locking the doors, and turning off the lights, while you wind down—all with nothing but your voice. There’s no need to compromise on sound quality with Echo, even in such a small package. Using its 360-degree omnidirectional audio hardware, Echo plays your favorite music, reads you an audiobook, or answers your questions with crisp balance and crystal clarity. Echo isn't just a great way to control your home: it's also a helpful, versatile personal assistant. Hosting a dinner party? Ask Alexa to turn on your favorite playlist, look up recipes, check the weather, and even unlock the front door for your guests. Smart Home Pros are a qualified, licensed, and expertly trained installation team that will connect Echo to your Vivint Smart Home system. You have enough to worry about: we'll handle the technical stuff and get your Echo up and running just the way you want it.